This guide explains to people with disabilities how they can participate in research and training projects, describes what research and training is, and what a participant can do. It also provides examples of projects and of ways to address problems others have had when working on research and training. It was developed by the Rehabilitation Research and Training Center on Aging with Developmental Disabilities and the National Gateway to Self-Determination. 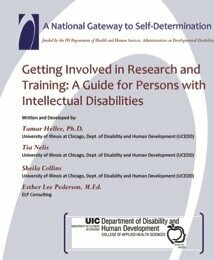 It is also on the National Gateway to Self-Determination website http://www.aucd.org/ngsd/template/index.cfm.